The themes in this book are very strongly presented. This book focuses quite a bit on bullying, and the difficulties of being true to who you are. I know this is something that's hard when you're young, especially when you're a teenager. Hoole has an interesting take on it. It had a difficult start, and remained pretty disjointed until the middle. I just could not get into this book until the middle, which says a lot about it. There was just something about the writing that didn't work for me until I adjusted to it. Cass was a fully dimensional character. While there were certainly things that I didn't like about her, I certainly found a few of her emotional experiences relatable. She went through lots of confusion, and definitely some self-doubt. These are all things that everyone goes through at some point, and Hoole wrote them pretty well. I have a soft spot for the romance. Darin was encouraging, and a really sweet guy. It works out great because this is certainly not the main focus of this story. Sometimes Never, Sometimes Always did have some favorable elements to it, as you can tell from my brief list. It might not have been precisely my cup of tea, but it ended up being an okay read. It doesn't particularly sound like my cup of tea either. But I love the cover. I'm a sucker for any type of mason-like jar! I have trouble adjusting to books when the narrative is hard for me to follow. It sounds like the same sort of problem for me. I agree with Leandra, though - I love the cover! The problem with Flux is - the covers are AWESOME and the stories tend to be disappointing. My general opinion about this book is that there really was a bit too much going on-so many issues were tackled and I felt overwhelmed. I also kind of agree with Hannah Lorraine's opinion-I've had a lot of mixed experiences with Flux. 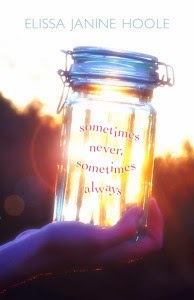 Sometimes Never, Sometimes Always is a interesting YA contemporary that touches on a variety of issues, including religious, finding yourself, sexuality, friendship and bullying. It was a contemporary win for this fantasy reader!